Orion the Mighty Hunter – perhaps the easiest to identify of all constellations – rises at mid-evening in late November and early December. Depending on where you live, Orion will climb over your eastern horizon by around 8 to 9 p.m. tonight. Orion appears to be lying on his side when he first ascends into our eastern sky. 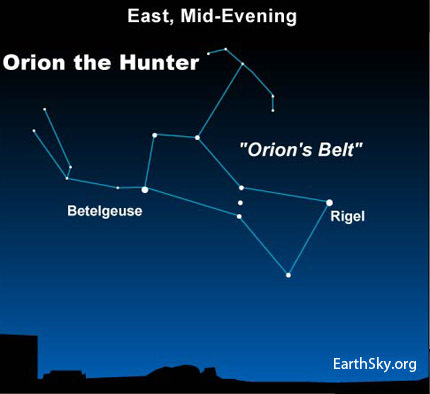 Orion’s Belt of three moderately-bright stars juts more or less straight upward from the horizon and Orion’s two brightest stars – Betelgeuse and Rigel – shine on opposite sides of the Belt. As night passes, and Earth spins beneath the sky, Orion will climb higher in our sky. 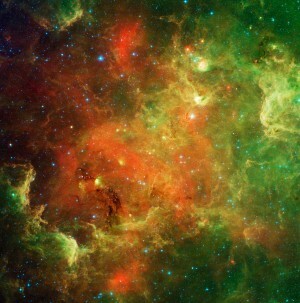 At its highest in the south, it is a huge, noticeable star pattern. Like all the stars, Orion’s stars rise some 4 minutes earlier with each passing day, or about 2 hours earlier with each passing month. If you see Orion shining in the east at 8:30 p.m. tonight, look for Orion to be in the same place in the sky at about 6:30 p.m. a month from now. By this winter, Orion will be visible in early evening at its highest in our southern sky – the same place where now you have to see it late at night. This shift in Orion’s location is due to Earth’s movement in orbit around the sun. As we move around the sun, our perspective on the stars surrounding us shifts, as our night sky points out on different regions of the Milky Way galaxy. Are you familiar with the W or M-shaped constellation Cassiopeia the Queen? Or Polaris, the North Star? After Orion rises – when it appears in the east as it does this evening – you can always look for Cassiopeia at its highest above Polaris in the northern sky.